1. NoyoSpanish $7.99- This is an incredible app for Spanish learners, as well as for Spanish-dominant children. It features over 200 scenes, with over 1800 vocabulary words in 8 targeted units. The illustrations are fantastic and engaging. Visit their website for more information. 2. Kandoobi Animales $2.99- A full-immersion Spanish app that features over 100 domestic and wild animals. There are four components to it: Letras, A colorear, Raya y rellena, and Igual a la silueta. We loved this app. Click on the link to read my full review. 3. 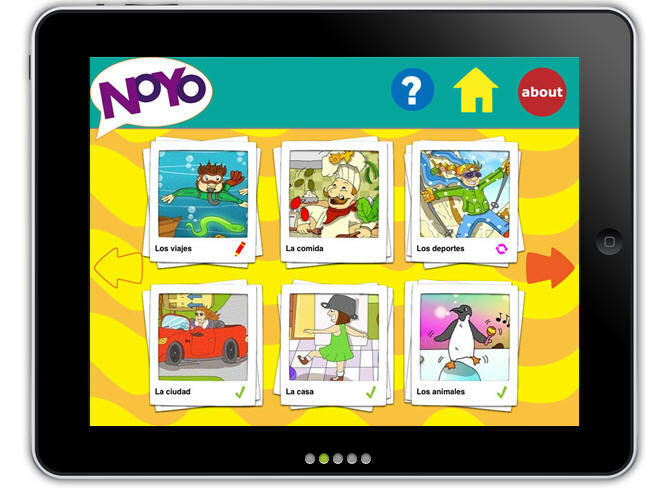 Ana Lomba's Spanish for Kids apps FREE- Lomba's fun and interactive apps focus on storytelling to teach language. Her immersion classic storybooks are available for iPad. The first app, The Little Red Hen/La gallina roja, is FREE, so try it out. The link will take you to a more thorough review from Fun Educational Apps. 4. Little Pim $2.99- This app teaches basic vocabulary about eating and drinking, playing and sharing, sleeping and waking. It includes three interactive games and each game includes three levels of play, covering basic nouns (level one), verbs (level two), and short phrases (level three). 5. eBooks for iPad by Maroe Susti $.99 to $1.99- These are beautifully illustrated and written books with full text in both English and Spanish. You can read a review and interview with the author/illustrator on the LBBC. You're welcome. Will continue to keep an eye out for more! Thanks for sharing about Spanish Apps for Kids? Do you have any recommendation for math app? Gracias! Estas Apps estan buenisimas para mi nena practique el españo! Los pollitos for Android coming in August. in the mean time iphone available for FREE in the iphone store now! https://itunes.apple.com/us/app/los-pollitos/id527097576?mt=8 My 2 year old daughter is it's biggest fan!